Matthew Brown is the Retail Manager over here at Tim’s Music and has been with the company since 2010. He graduated with his Bachelors of Music degree in Instrumental Performance from California State University, Sacramento in 2010. 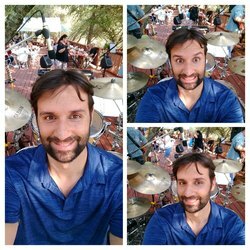 He also moonlights as a professional drummer and percussionist in the Northern California region. He has performed or recorded with such acts as: Conrad Herwig, Velvet Brown, Talujon Percussion Ensemble, Camelia Symphony, VITA Academy Orchestra, Boomer, and Voxville. In his “spare time” he enjoys spending time with his family, watching sports, and long distance running.